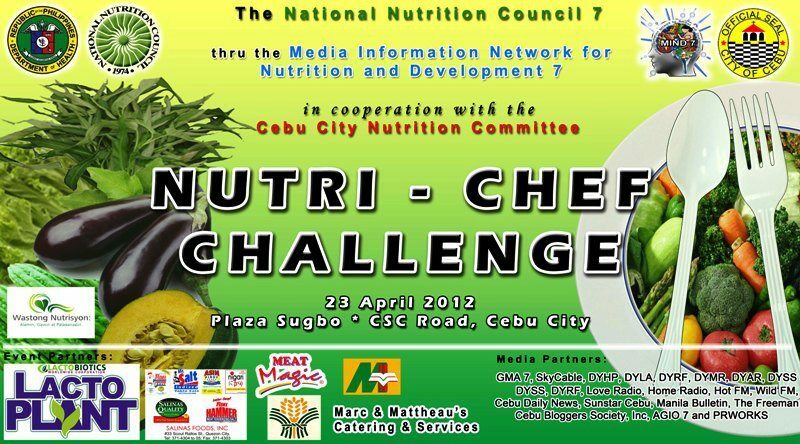 The Nutri-Chef Challenge was initiated by the National Nutrition Council 7, Media Information Network for Nutrition and Development 7 with Cebu City Nutrition Committee which was held last 23 April 2012 at the Plaza Sugbu, Cebu City. 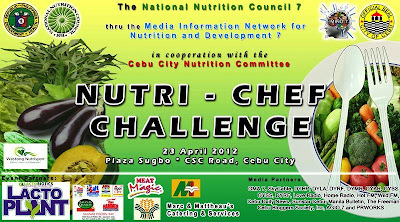 During the launch last year, during the opening of Nutrition Month celebration organized by the National Nutrition Council in Central Visayas (NNC-7) at SM City Cebu, the nutri-chef challenge is implemented at the barangay level through the barangay nutrition scholars, said NNC-7 regional coordinator Dr. Letlet Mission. “Most of the children don’t like vegetables. This is our way of promoting the nutritious food (vegetables) among the children who are easily attracted to commercials endorsing junk food and other non-nutritious food,” said Dr. Mission. Looks can be deceiving but the taste buds do not lie as well, one of my first impressions is that the food prepared was soooo good looking, mouth watering, that you would not think that most if not all the ingredients used were vegetables!! And when I tasted it, it also taste good! If food were made to look and smell this good, I would've eaten my veggies when I was a child, furthermore I think children today will even eat this if served in our public schools! Also, to be honest, I always wanted to watch a battle between chefs or cooks just like those seen on T.V. like IRON CHEF, MASTER CHEF, TOP CHEF and many more food reality contest shows; and this was the 1st one I have observed and even tasted in one! AWESOME! It's both my fantasy with a cause come true! palatibilty (25%), use of nutritious ingredients (25%), originality (20%), visual appeal (15%), and ease of preparation (15%). The board of judges was composed of Ms. Josie F. Elli, Senior Science Research Specialist of DOST 7 who was also the chairperson, Ms. Trinidad R. Sumalinog, RND, Canteen Concessioner & food entrepreneur, and Mr. Marlou Almasco, Sous Chef from Golden Prince Hotel. Nutri-Chef Challenge 2012 Sponsors: Lactobiotics; Worldwide Corporation; Salinas Foods, Inc.; Meat magic; Miller hospital; Marc and mattheau’s catering and services; Department of Agriculture 7; Golden Prince Hotel. “Nutri-Chef Challenge” is a cooking contest designed to promote vegetable recipes among the children. The challenge involves cooking contests with green, leafy vegetables as the main ingredients. A panel of judges that includes a local nutritionist will select the top three contestants during the contest.A group of children will taste the recipes of the top three contestants to determine the winner. Ms. Regina Mercedes Lingaolingao’s Mixed Vegetable Omelet got the judges’ nod and won the coveted first prize during the Regional Vegetable Recipe Development Contest cook-off. Her winning recipe with squash, carrots, chayote, malungay and egg as main ingredients bested all the other seven finalists. She took home with Php10,000.00 cash prize and gift packs. The judges gave her and her recipe a score of 91.67%. 2. Shred malunggay. Set aside. 4. Beat egg and season with salt. Set aside. 5. Heat 3 tablespoons oil in frying pan. 9. Remove from heat and add in beaten eggs. 11. Cook omelet with vegetables. Garnering second place was Ms. Teresita Flordeliz’s “Sautéed Vegetables with Fish” with a score of 86.33%. Winning third place was Ms. Teresa Carabuena-Dizon’s “Vegetable Bola-Bola Rolled in Biscuit Crumbs” with a score of 83.67%. Winners for the second and third place received Php8,000.00 and Php6,000.00 plus gift packs, respectively. Consolation prizes of Php2,000.00 and gift packs each were given to other contestants. Vegetable Bola-bola! --I TASTED THIS ONE AND IT WAS LIKE FLAWESOME!!! The organizers also gave out Nutri-Chef Special Awards, namely; the Super Saver’s Award and the Children’s Choice Award. The Super Saver’s Award, an award given to the recipe with the least total cost per serving was cornered by Ms. Roxanne Charity Lingaolingao for her Creamy Mix Vegetables with Dried Dilis. On the other hand, the Children’s Choice Award, based on the recipe garnering the highest smiley points given by the 5 children judges, was awarded to Ms. Florentina Bulgado with her recipe Tortang Kapayas. The winning recipes will be compiled into a recipe book that will be printed for distribution to beneficiaries of the government’s Pantawid Pamilya or the Conditional Cash Transfer program administered by the DSWD as a way for NNC to contribute to improved nutrition of poorest families. The recipe book will also be distributed to local nutrition workers as an IEC material for helping families improve their meals and develop healthy food intake.